My friend, Shannon (shannonkaypaperie.com) makes beautiful cards! This is a CASE (Copy And Share Everything) of one of her creations. I used different paper and colors, but I loved the layout of her card. The stamp set "Better Together" provides the happy hat (fussy cut) and sentiment. My lovely By The Shore Designer Series Paper provided my color scheme in Dapper Denim, Calypso Coral and Very Vanilla. I used a double round of retired Gold Baker's Twine to tie a bow and finished with one Calypso Coral Enamel Shape. 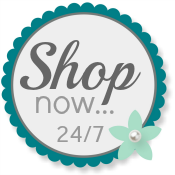 Please use my Online Store any time you are ready to order your own Stampin' Up! products. Thank you for looking today. Won't you please leave me a comment?